Mr Townsend is speaking for DTPLI, and the Minister of Planning. Townsend tables proposed permit exemptions for use of land highlighted in a lengthy document. He says the CIS (ch 17 p3) sets out the roles and responsibilities under the Environmental Management Framework (EMF). He says the contractor must comply with the EMF, which includes performance requirements and conditions. Townsend says the Mininster for Planning will receive audit reports about the proposed East West Link from independent auditor. He says the EMF will need to be updated after approval and that the contractor will need to develop a Construction Environmental Management Plan – this will have some delaying effect on actual construction commencing. This plan can be amended from time to time. Townsend outlines advice about how the Assessment Committee might draft their report and what DTPLI are looking for. Pitt, for the City of Melbourne says Melbourne do not support viaduct Part B. Raises the Land Acquisition & Compensation Act which Pitt says is outdated. Solatium never used in last 25 yrs. In the case of a dispute about aquisition, he says the resident will always be at a disadvantage as cannot afford to legally challenge. This directly relates to social impacts even though not part of terms of reference. On design, Pitt says the western portal should be redesigned but LMA have not considered any alternative designs except Yarra’s Diamond, despite “upwards of 16” alternative proposals being put forward. He says alternatives need to be explored in detail, including the Higgs design which ws submitted over a month ago – yet LMA has not changed its position. Regarding alternatives, he recognises there will still be impacts – there is no win win in this – but looking for least impact and the LMA should have done this. The City of Melbourne says that given there is no final design, only a reference project, the public a should have a chance to respond to the final design. On traffic experts did not agree on much but did agree that drivers will need to be able to get on at Hoddle st and travel to the west side of town. Finanzio for the City of Yarra says the Assessment Committee should recommend refusal of the reference project regardless of whether it thinks idea of linking East and West is a good idea or not. He says the Reference design is illusory and seriously deficient and that the LMA has not properly identified impacts. He says notwithstanding overall position, will make some comments re planning controls and other matters. Planning Scheme Amendment as drafted makes this whole process a farce as it allows Minister to approve basically anything. Agree with the City of Melbourne in this regard. He says the Committee is empowered to request a supplementary CIS – “we submit nothing constrains you in doing so”. He talks about alternatives that have been put forward – if they reduce impacts then this would show that reference design is deficient. In reality Finanzio says the Committee’s decision is not a matter of legal representations but whether all options have been properly identified to produce the best outcome. 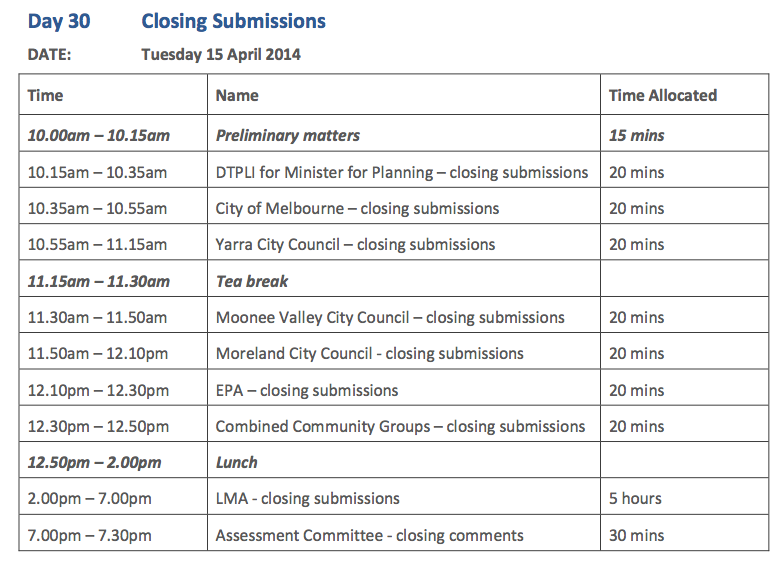 Yarra’s other submissions are discussed in its tabled document – and were not discussed further. Most draw attention to omissions and failures in CIS. He says the CIS is meant to provide enough information to make an assessment – on this basis should reject. He says if this was any other planning proposal it would be sent back to drawing board by VCAT – he asks why should standards be different here? Finanzio closes by saying the Committee should not recommend approval of reference project. Hicks for Moonee Valley City Council proposes relocation and mitigation options as if this is a condition report. She is seeking an “equitable result” for their client. She says the City of Moonee Valley agrees with Melbourne and Yarra on amendments to draft incorporated document. Hicks says there was and has been insufficient consultation re Ormond St offramp. On noise and air impacts, Moonee Valley will approach EPA re background noise monitoring and air quality monitoring to be collected over some time in order to inform assessment of mitigation measures. Hicks reiterates that elevated structures are unacceptable. Says the proponent has relied largely on the “missing link” argument. Griffiths says what this project represents is a “short cut between two currently recognised traffic jams”. He says the Committee should recommend project should not be approved as triple bottom line assessment has not been observed. Griffiths says the Performance Requirements need amendment and the Assessment Committee should consider an independent project manager to ensure all parties adhere to requirements. This body could also potentially deal with land acquisition. Moreland says the Ormond St off-ramp should be deleted from design. As there is no on-ramp it means one arm of journeys in one direction need to use local roads. Need to address traffic volumes on local roads. A variety of City of Moreland plans now need to be substantially redefined if this project goes ahead at considerable cost. Moreland says there is inadequate protection of residents from noise at night. Local experience with M80 is that residents experience in excess of 60db. He says sleep disturbance and associated health consequences from road noise are well documented. Loss of land at Holbrook Reserve compromises Council’s ability to provide recreational amenity and Council is concerned that Ormond St offramp will compromise access point to reserve. Moreland recommends a suite of Performance Requirements to address Ormond St offramp and it’s construction. Griffiths said Victoria is a leader in road safety and we should be a leader in road health. McGuinness for the The EPA says key risks that must be managed include – air quality, noise and environmental management. EPA’s modelling says the proposed East West Link ventilation will comply with state policy. Says the inclusion of filters would not provide any “measurable benefit”. EPA says the vent stacks will need to meet applicable noise limits. Says the final detailed design is still to be defined. Says the EPA requires assessment of the final design to confirm compliance will be achieved. EPA expects to be consulted on the detail of the Environmental Management Plan and monitoring framework. The combined community groups are being represented today by Tom Pikusa. “What are the benefits?” Community groups say this question is harder to answer. Pikusa says LMA is asking the committee to trust it. The community groups submit that the we can’t know what the benefits are because we don’t know what the project is. Pikusa talks about loss to parks, community gardens, wetland and creeks and all the associated impacts on recreation and wildlife. He says the LMA has undertaken little or no assessment on whether these impacts can be avoided or minimised, and there is no assurance on whether impacts can be offset. Uncertainty because reference project not finalized. He highlights impacts on the Zoo, Urban Camp, Anzac Hall, hospitals, and the State Netball and Hockey Centre. Pikusa says the CIS does not include any elevations or sections, and mis-describes the type of construction proposed in Royal Park. There are no dimensions for the portals, no heights and widths of elevated flyovers to compare with adjacent uses, no tunnel sections, no locations or designs for ventilation structures, no design for gateway features, no rationale behind the designation of the project area and no information about the disposal of tunnel spoil. Pikusa says much of the evidence relied on by LMA comes from the Urban Circus model and yet no information is available about what went into this model. As cost appears to be a major consideration, the groups fear detailed design prepared by contractors “will be a race to the bottom”. Pikusa says impacts have not been described in the CIS or in its technical appendices. He raises departmental concerns about the Urban Design Framework, the LMA did not discuss these comments. Pikusa highlights that the land requirements in Ross Straw Field information from LMA is not consistent with the CIS – many facilities to be located off-site (according to the CIS) will now be located in Ross Straw Field. There is no justification given for occupation of the remnant vegetation and wetlands. Pikusa: “Quite frankly Royal Park should not be used as a builders car park” He says there is a high likelihood of unintended and adverse impacts. Pikusa says the alternative designs put forward by other Councils and groups such as Safety Net for Royal Park should warrant further consideration as they “are prudent and feasible alternatives to the reference design”. 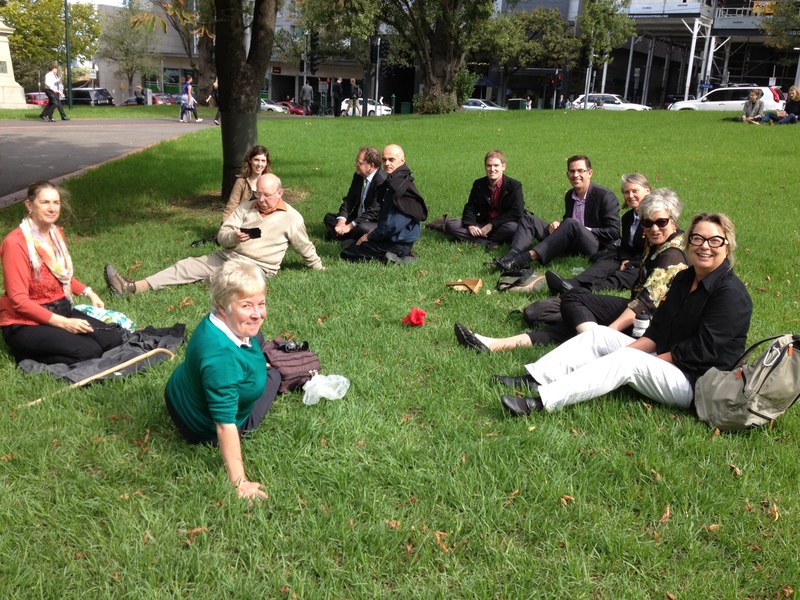 Community members prepared themselves for the coming five hours of LMA by soaking up some sunshine in Treasury Gardens (gladly no cut and cover being proposed here). The LMA then tabled a document to respond to what Andrew Herington said yesterday. They refuted Yarra’s claim the use of reference design not lawful – if Yarra wants to go to Supreme Court it can do so. The reference design is a tool to assist the panel in assessing the range and extent of likely impacts. The obligation to consider impacts does not require a fixed design. The LMA argued impacts can be addressed by management frameworks. These can allow for, in the case of noise for example, the design of noise walls or other mitigating factors. Changes to reference design occurred with CityLink with design benefits for all, the LMA claimed. So the reference design must have flexibility to allow for changes. On the matter of cost benefit analysis and business case – total incremental benefits should exceed total incremental costs. There is a fundamental difference between an assessment by government, and an assessment by the committee. It is neither necessary or desirable to rely on a cost benefit analysis in assessing the merits of a project. One cannot monetise things like cultural heritage etc. “Not everything that can be counted counts and not everything that counts can be counted” (quotes Einstein). The LMA argued the committee’s job is to assess this matter in qualitative terms. The fact that some are unhappy with lack of business case disclosure is not a matter for Committees consideration. However, net social benefits are relevant, they say. “Test” of net community benefit is a tool that can be used but it is only a measure. The planning system recognises the legitimate role of a developer to evaluate and initiate a project. Hence it is directed at ensuring that a project is “acceptable” having regard to what is in the Planning & Environment Act. On alternatives: the purpose of CIS is to evaluate the declared project. There is no requirement for CIS to evaluate other projects. Submissions that call for alternatives ought to be disregarded, argued the LMA. Any complaints about no alternatives is a complaint about the declaration of the project – it is a political matter and not for this committee to consider. Equally, it is not for committee to consider whether Part B is the best option. It is not up to committee to assess consistency of CIS with scoping directions. Not public hearing matters. Such criticisms are of no substance or of no consequence. Now to benefits: connectivity essential to the success of Melbourne. The EWL is not the only way east west connectivity will be addressed, but it is an important way. It will deliver significant mobility benefits. It EWL will provide future benefits. The case for EWL has already comprehensively made by Eddington – a detailed independent and balanced review. The primary purpose of CIS is to identify impacts and how these ought to be mitigated or managed. If the traffic volumes on the roads are back to current levels in 12 years, it just shows how necessary it is. The panel should also have regard to full East West Link ie including western link. The EWL will solve the problem of closures on CityLink that cause traffic chaos. Back to the Demons Diagram … knew this had to rear its horns again! What if money is spent on other transport infrastructure? The LMA gives a list of all the other rail projects: regional rail, Pakenham Cranbourne (announced a few weeks ago), airport rail announced yesterday, metro rail, Doncaster rail. Money from EWL won’t pay for metro rail. Impacts of metro would only reduce traffic projections by 0.4%. The LMA again argues residents living along the freeway corridor are not PT users. (They are expected to use invisible trains to prove otherwise it seems). Now a lesson on Boston and Toronto. And a lesson in population growth and car ownership and use. Notwithstanding PT and bicycle initiatives in so-called “green” suburbs (Yarra etc), car ownership on the rise. So the LMA don’t accept “don’t build it and they won’t come”. Travel time benefits will be significant says LMA. Zeibots and Thompson as experts were just speculating: no one challenged in any meaningful way the travel and transport benefits. The LMA takes issue with Age report that peak hour traffic in 2031 will slow to 20-30kms per hour. Tells all submitters should have relied on CIS not the Age. Pelosi had correction in Age next day to say speed should be 80 km’s per hour. With respect to North/South movements: Alexandra Pde is at or near capacity at peak times. With the EWL, traffic in Alexandra Pde will decrease 20-30%. Traffic will also decrease in surrounding roads including Bell St and Brunswick Rd. The LMA argues that the additional cars on Eastern Freeway will be coming from alternative routes. Even if there is induced demand this merely enables a latent demand to be expressed. Now the LMA attacks the Yarra Diamond interchange saying the EWL too important to be used as a guinea pig. Most criticism of flyover relates to visual impacts (ummm – the decimation of homes was mentioned a few times….). Chair: A number of consortia are talking to people. Does Morris know if they are talking about alternatives? Morris – confident they are sticking to original design. Mr Morris replied that LMA cannot disclose details of tenderers’ discussions. LMA dismissed Higgs final alternative design for Elliot Ave as rushed and ill conceived. Elliott Ave exit was supported by Eddington to provide access to Parkville. There are few places where a connection to CityLink can occur. It requires an elevated structure. There is need for a staging area of considerable size to build tunnel. Most traffic using Ormond Road is local traffic. They will enjoy a benefit: it’s what a road is for. Council is acting against own residents, says Morris. The LMA are prepared to monitor traffic on local Moonee Valley roads to assess impacts after it is built. Any adverse impacts could then be assessed. It is ‘desireable’ to finalise planning of the southerly connection to Port of Melbourne. Although not yet funded, this is of no relevance to committee. It is in the public interest to finalise alignment soon – provides greater certainty for land owners. It is essential to deliver benefits of full East West Link. Impacts on Arden Macaley can be managed. Viaduct cannot be accommodated on east of CityLink. Traffic flows could not be accommodated on CityLink. Impacts on Arden Macauley will not compromise achievement of objectives of urban renewal according to the LMA. Urban development can and should be integrated with EWL. Additional noise of Part B will be small. Moonee Ponds Creek – it’s artificial already. Chair asked: Are bidders bidding on Part A or on both Parts? Morris responds: Everyone bidding on Part A only, but they may decide to bid also on Part B as a variation. Safety Net For Royal Park fails to understand the complexities of tunnel construction – so their alternative fails. LMA provides an explanation of what has to happen at ends of tunnels – so it is not viable. Moving Part B closer to west side of CityLink (reducing impacts on SPAusnet, Vision Australia, Bent St apts etc) may be possible, but not a necessary prerequisite for approval of Part B. The urban design prescription is unsuited to a major project that must respond to functional road design principles. Prescription may stifle innovative design outcomes. You will still be able to cycle and walk through Royal Park. The Memorandum of Understanding with CoM is appropriate response to impacts. LMA considers area beyond Upfield Railway to be separated and of less heritage value. Alternatives move impacts to other areas, but do not reduce them. Chair: Will residents living close to Royal Park still have access to open space? LMA: Unequivocally yes – will still have “outstanding” access. LMA says the importance of baseball field has been overstated from a heritage point of view. Not of historical significance. Baseball is an American sport, not significant in Australian history. Cultural significance of Royal Park remains substantially intact after the project, notwithstanding impact on Ross Straw Field, which is a part of Royal Park separate from the main part. LMA recognise the likely to impact on community facilities. The LMA is prepared to commit to a ‘master planning process’ for Debneys Park Estate, to ensure playground rebuilt to existing or better quality and new community centre. No reason why garden can’t continue – show shadowing at 10am equinox. The LMA says it is inevitable that there will be property acquisition. Avoid much of it by building a tunnel – need to recognise that. Re injurious affection – ie those left behind – standard method is to consider only land in project area. Can’t do anything – for people who can’t sell homes. The LMA will manage noise and dust appropriately. Aa agreement in principle has been reached with SPAusnet assuming Part B follows reference design. Vision Australia needs will need to be addressed. Moonee Ponds shopping centre facilities won’t be adversely affected to any significant degree. Q for Morris from committee re EVO apartments:They are outside the project boundary. Why was an agreement reached. Morris: Technically a small portion of the property is in project boundary so technically apartments not wholly outside the project boundary. Morris did invite committee to make principle recommendations (as opposed to specific recommendations re individuals) about how those just outside project boundary be treated. He did use the word compassion there somewhere. Removal of buildings for temporary road and flyover. They are on edge of each precinct and key heritage values would continue to be demonstrated. This is not a ‘normal’ project having regard to its city shaping character. The EPA says noise is a matter for vicRoads. VicRoads policy applies. Morris for the LMA says that where existing noise is 50db or less then increase shall be no more than 12db above existing level. Otherwise for new roads the limit is 63db. Standards are mandatory not just guidelines. LMA have looked at NSW policy and it is aspirational, not mandatory. Public open space should not be treated the same as private open space in relation to noise. The unknown is being exaggerated when compared with actuality. Trade off between size of noise walls and reduction in noise. Arden Macaulay will only marginally increase and new developments will need to consider this. Dr Heilig’s evidence should be accepted. It is not up to committee to replace or raise or modify the objectively ascertainable standards. Our PM2.5 standards stringent by world standards. Modelling has been comprehensive. Vent stacks will have inconsequential impact. – no more than. 0.02 annual average increase. Except in the vicinity of portals, effect is very small ( NHMRC report). Tunnel ventilation systems designed to allow people to breathe the tunnel air. No tunnels in Australia have filtered vent stacks. M5 filtration trial shown to be ineffective and not cost effective for removing PM10’s. Costs $$17.3 to. Remove with filtration and only $300,000 to remove at tail pipe. Need to lower vehicle emissions at source. Air emission standards a matter for policy makers not the committee. Experts say vegetation in Royal Park is not strategic – it doesn’t matter, not important. The Concept Plan 1992 lacks current relevance. Lower reaches of creek serve no significant biodiversity function. Perhaps an amenity function. Part B can proceed with an upgrade to qualities of the creek. LMA wrongly stated in their closing submission that the Moonee Ponds Creek Concept Plan (1992) was not relevant because it predated City Link. However, CityLink was built one side of the Creek corridor, so the Concept Plan’s proposals, earlier described to the committee, to ‘naturalise’ the creek with rock linings and plantings above the concrete batters around Travancore and upstream remain totally relevant. EWL’s pylons and viaducts would ride rough shod over such measures. Wetlands and white skink – are of local value and not of state significance. Will reinstate values. Migratory birds will not be materially affected. Bats will not be impacted. Grass circle of low ecological value and any impact will be of little biodiversity significance. Surface water – we understand the issues well. Groundwater – experts conclave agreed impacts appropriately addressed. Contaminated soil – parts of Ross Straw Field can be used to stockpile with mitigation measures in place. Performance Requirements – the LMA tabled a document outlining suggested changes to PRs and LMA’s final position. Includes all suggested changes from all submitters. Some agreed to, some partially agreed to, others not agreed to. All colour coded for ease of reference. Re Urban Design Framework – similar approach, and have sought to include Andrew Herington’s suggested changes. Congratulates those who came and lasted the day. Very constrained by all timelines for this project. The Chair summarised the major milestones since appointed; acknowledges committee members, advisors, legal counsel Chris Wren, staff especially Emma Moysey, Jessica Cutting, David Newton and others in PPV. This is first hearing under MTPF act and it has been challenging. The committee acknowledges community response to these limitations. Four babies born in time of hearings, and attendees suffered a bad bout of gastro. The Chair says the committee will take up further site visits also to individual’s homes. The report is due 30 May and will be fulsome and detailed. The Minister needs to release the report by 30 June. No further docs will be received. The Chair thanked everyone for their contributions: they were high quality and presentations were of a very high standard. Made our job much easier. Stuart Morris in his closing statement for the LMA acknowledged that there would be noise impacts from the EWL on open space and that jogging or cycling by would be okay (forget about passive recreation of walking, playing with children, bird watching!) and dismissed the requirement for noise limits for open space, saying “people can just move away” from the noisy EWL road infrastructure. What will happen in practice is that people will avoid all together going near noisy EWL spaces and, in effect, even more open space/parkland will end up being alienated due to the aura of traffic noise. In trying to show how little of Royal Park would be excised by the EWL, the LMA closing submission showed a picture of Royal Park and – guess what it was all coloured green – purportedly showing how much open space was available to local residents. When one excludes the areas not open to informal public access, such as the State Netball Hockey Centre, Zoo, golf course, roads, car parks, pavilions, caretakers houses, depots and deletes the large amount to be alienated by the EWL and its associated impacts around Elliott Avenue and Royal Park West, the amount of green becomes significantly less! Suggestions from the Linking Melbourne Authority that the Better East West Link Design did not allow for cut and cover tunnel construction in the Arden Macaulay precinct are factually incorrect. In addition they claimed that by using the Arden Macaulay precinct for tunnel entrances would prevent urban renewal on this site. Not only does the better East West Link Design prove that this is not the case, the current reference design has already prevented urban renewal beginning. The best outcome for Arden Macaulay is for no project to go ahead. The next best thing is for the Better Design. The LMA reference design will be a disaster for the Moonee Ponds Creek and for Kensington. Great to be part of Day 23 where the community did an awesome job in trying to protect Royal Park and Moonee Ponds Creek and to have Professor Irving there belting it out eith Mr Morris was the icing on the cake. As I can’t be at the hearings, the blog is extremely valuable for me. Thanks very much for all the work you’re putting into it. Pleasure Paul. Lots of hands at work. glad it is useful for you. It is really useful Rose. Thank you so much for keeping us (the community) informed. I agree with Dr Sturup when she says only a new soverign can over rule the soverign. I agree with you and her that a change of government is necessary but not sufficient to kill the project. I hope all our efforts help to kill it but who can guarantee the election result. The panel have to work within the planing context of their terms of reference. I agree that a pledge to tear up the contracts is the most important thing to work for outside the planning process. Better East West Link Design is a collaboration between the Safety Net for Royal Park and architects Atelier Red+Black. The site presents alternative designs that have been proposed for the project to highlight how inadequate the LMA’s efforts were to consider alternatives to avoid and minimise impacts and highlights public transport investment as the best solution for traffic congestion. Although this blog editor distances herself from the design. As one from Vermont South, I stand opposed to ANY East West Link. To add to what Rose said, I seek solutions that takes traffic off the roads. It is inconceivable that a city the size of Melbourne can’t get it’s public transport working properly. Watered down EWL proposals are still unacceptable, and I have 57 petition signatures from Vermont South that agree with me. Let’s redress the past under-investment in public transport. Hi Nick as one of the Architects from the betterEWLdesign.com partnership I can assure you that we are also opposed to any East West link. We have put this design together as a safety net so that should the experts and the public be unsuccessful in stopping the politicians push through the tunnel, then at least we don’t lose royal park, 55 homes, the seeing eye dogs facility and Ross Straw field too. The betterewldesign team have provided a great service in showing just how poorly thought out the reference design is. This may assist the panel to reject it outright. There is still a risk the panel don’t and so it is pruident to manage this risk by exploring less impactfull alternative. This does not give tacit support to the project when the authors have said explicitly they don’t support it. It is fantastic to have architects prepared to publicly critique bad architecture and urban design. Hi Chris/betterEWLdesign, I’ve seen your comments and you might be right. However, Dr. Sophie Sturup states that proposing alternative designs sometimes plays into the devil’s hands. It’s all part of the Mega Project Mindset. That’s why (apart from studying the DDI interchange idea) I’ve spent most of my energy seeking volunteers, sharing ideas, gathering petition signatures, and other actions of total opposition. While I’m on that, possibly the most important thing to do now is pressure Labor candidates/members to “rip the contract” (cancel the contract if Napthine signs it prior to the election). I agree Nick that we need to invest further in public transport. When I say invest, it needs to be billions. I hate public transport with a passion and have not had a good experience in the last five years. Late, dirty, unsafe and the car gets me there in half the time. We are a car culture because the alternative is just so so so bad. I don’t know what is worse, our public transport system or Myki……it’s neck and neck!!! The CIS is a farce because we will not know what the environmental consequences of the project will be until a tender has been arranged. It will then be up to the tenderer to work out a scheme without a further CIS. Interesting, the (non) release of the full business case came up today (Wed 19 March). The WestConnex business case is to be released. The NSW Govt has been ordered to release the WestConnex business case along with other documents/plans for that tollway, within 21 days. The motion was put by the Greens and passed by the Shooters Party and the Labor opposition. This was on 4 March (21 days runs out on 25 March). We have already lost a substantial amount of space in Royal Park due to the new RCH. Parts of the site that were supposed to be returned are still not accessible and not looking anywhere near close. Increasing population and decreasing open space is such a bad decision. Also lots of kids in Kensington use the playground at Debney park. There isn’t much for the kids in the bottom end of Kensington. Nicole, the panel asked me today whether children from other areas use the playground. We should collect some data on the families who use the playground. Rose, a lot of the Travancore kids use Debney’s Park too. From ALT building and Siena apartments and from further up in Travancore. The children’s park in particular is very popular. I’ve chatted with people from North Melbourne who use it too as it is regarded as the best park for a long distance around. So not just Flem/Kens kids! Shocking behaviour – the heritage expert who once described Wellington Street as one of the most intact streets in Clifton Hill, now deems it a moderate ‘risk’ that 12 properties will be removed from the overlay and demolished. The experts are supposed to be independent and advising the panel, not the sponsor. Shame. Great to hear that Mr Wren asked questions to Mr Lovell today (11 Mar) about “avoiding” impacts by considering alternatives. Appendix G of the CIS contains the Lovell Chen report and appears to contradict Mr Lovell’s comments today. However, after Section 2.3.1, there is no reference to variations or alternatives…. Hmmm. Veitch is a civil engineer, graduated 1972. Much of his career has been around policy as far as I can see. I suspect that there are qualified applied mathematicians around who could do a better job of this. They might took at all the factors such as impact of fuel prices/shortages. Probably wouldn’t come up with such dogmatic answers. Put him in google and it comes up with multiple entries for a comedian! Yes – not to be confused with Michael Veitch the D-Gen Australian comedian! Why was the SGS witness withdrawn? The Veitch traffic figures indicate that almost 3/4 of the traffic from the tunnel will travel north up the Tullamarine Freeway (i.e. north) and yet it is called Stage 1 of the “East West” Link. Does this confirm that Stage 1 is actually to help the Eastern suburbs residents to arrive at the airport quicker? Lots of talk re airport travel today. Veitch also said research showed people were more willing to pay tolls on a route to the airport. Not exactly, just to get to and add to Tulla Freeway congestion quicker. Obviously it is the East-West link to Tullamarine (for those who find the airport to be to their west). “no objections had been received from the Arden Macaulay precinct east of CityLink” which is precisely why the design should show it going down that side and not on the west!! Der. P.S. I must qualify this comment by saying the thing should never be built though! It’s almost like being there! …not many people like you!!! Yes… I DID mean it positively! I realised the ambiguity after I posted it! Congratulations to you and other contributors! It’s going to be a ‘long haul’!!! Thanks for the write-up. Very interesting.